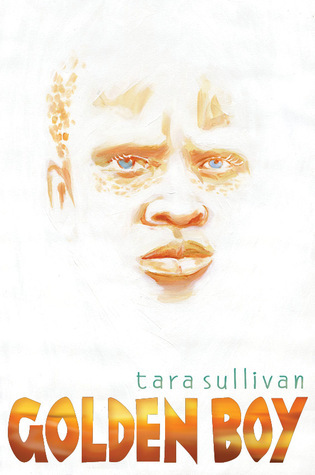 Today’s guest for the SAT (Successful Author Talk) is fellow Class of 2k13 member Tara Sullivan. Tara’s debut, GOLDEN BOY will be available from G.P. Putnam’s Sons (Penguin) June, 2013. Thirteen-year-old Habo has always been different— light eyes, yellow hair and white skin. Not the good brown skin his family has and not the white skin of tourists. Habo is strange and alone. Only his sister Asu loves him well. But even Asu can’t take the sting away when the family is forced from their small Tanzanian village. Seeking refuge in Mwanza, Habo and his family journey across the Serengeti. Suddenly, Habo has a new word for himself: Albino. But they hunt Albinos in Mwanza because Albino body parts are thought to bring good luck. And soon Habo is being hunted by a fearsome man with a machete. Kind of a bit of both… I start with an idea and try to plan it out, but I always hit a wall I can’t figure out. It’s only when I start actually putting words on paper that the story unfolds around previously-impossible problems. My debut, GOLDEN BOY, took me two years… though really the publication process has involved so much editing that I would count this year too. I’m rep’d by the phenomenal Caryn Wiseman of the Andrea Brown Literary Agency. Here’s the story of how I got her interested in my work: I am a member of a writer’s group and, as such, we were able to get a grant from our local chapter of SCBWI for writer’s group development. We decided that, since we were all just starting to think about querying our work, the best use of this money would be to get an agent to talk to us. We sent a proposal to Caryn (as she expressed an interest in her online profile for work that fit the descriptions of what each of us was working on at the time) for a Skype video-conference and she agreed to talk to us about querying and the market in general. As part of the presentation she agreed to critique a query letter and 10-page submission from each of us to help us perfect our pitch. The evening was a phenomenal success: we all learned a lot about querying from an agent’s perspective, got to ask very specific questions, and heard a professional critique our submissions. Thought it wasn’t officially a “query,” Caryn asked to see the full manuscript of GOLDEN BOY as soon as I had it ready. Luckily for me, she liked it when she got it and I have been able to benefit from her tireless, wonderful representation. I like to tell this story to people because I think it’s a valuable lesson: think outside the box! Try to cultivate relationships with professionals in the field without asking for something back right away. Use resources available to you (especially ones that lend you professional credibility, like the SCBWI) to learn more about agents, your craft, and querying. If you don’t come through the regular channels, you never know what might happen: with a little extra careful reading, you too may get selected by your dream agent! Find a way to de-couple your personal sense of self-worth from your query. This is really, really hard to do, but if you *can* find a way to not take it emotionally when someone (your writer’s group members, an agent, a well-meaning friend) critiques the way you wrote it, your query will slowly evolve into something better. Hasn’t happened yet… I can wait until June 27th, 2013!! Let me first squee about my cover: Jesse Joshua Watson did a phenomenal job of putting a compelling portrait of Habo, my main character on it. Yay, Jesse! To answer your question: some. Though I didn’t get to have much say in the overall design choices, I was actually amazed how much the people at Putnam/Penguin took my input into consideration. For example, in an early draft Habo’s face floated more and I was concerned that it didn’t show clearly enough that he was albino. Jesse went back and added in the sunspots, the hair, and gave Habo that hauntingly vulnerable look. I was even allowed input into the choice of text. All in all, I feel very listened-to. So far, all of it! I’ve been told I will get to meet my in-house (As opposed to out-house? I’ve always wanted ask, but can’t quite find the gumption.) publicist about six months before my release date… so SOON, perhaps, I will have someone to help me with it. For now, though, you can come find me at my blog and Twitter. Also, GOLDEN BOY can be pre-ordered on Amazon & marked as to-read on Goodreads! Holy Moly, that cover is amazing! Great chat ladies. Rena – Isn't it striking? Fantastic! I so adore this cover, and I LOVE your story about how you got the best freaking agent in the entire universe! Terry – Agreed! What a great out-of the-box example! Fabulous cover and amazing-sounding book. I've actually spent a little time in Mwanza, but have never read a story set there, so I'm really looking forward to this. Best of luck, fellow Tara!